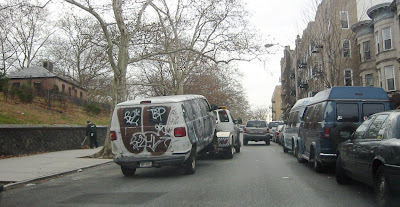 Parking is always a risk and a challenge in Brooklyn. Alternate side parking days often have harried residents dashing into the street 10 seconds prior to (or following) the posted times. There are also other hazards like getting blocked in by a double-parked vehicle, having love notes left on your windshield (BViB tip: always leave your number in the windshield to promote neighborly relations), and of course, having your bumper/mirror attacked by a desperate attempt at squeezing into a space. The fact is, double-parking is illegal, but how else can a gas-guzzling vehicle owner (of which I am one) survive? Those of us with cars know the risks, but that doesn't make the reality sting any less when it doesn't quite work out our way. Well, I won't go into the details, but the photos in this post show what I think is the result of Karma. I didn't gloat when I saw this, but I wasn't particularly surprised either. Let's just say that the owner's unkind actions (No, not illegal. Just unkind.) and his very possible destructive actions (I can't PROVE it, but I KNOW it.) were re-paid just a little bit today. 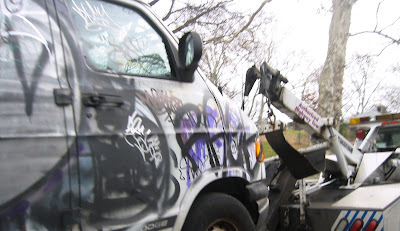 His colorful van was back within an hour, but it took up a good chunk of his morning. That's enough for me. No worries. This was just yesterday, and it is a different van (or a later, more colorful version of the van). Yours definitely seemed like a Repo job.